Jeremiah buys a field. Faith in the future. TiS 687 God gives us a future (Smith) Great words to a very easy hymn tune. Careful not to let the tune get too pompous or plodding! "God gives us a future, daring us to go into dreams and dangers on a path unknown. We will face tomorrow in the Spirit's power, we will let God change us for new life starts now!". Lyrics here (scroll down). 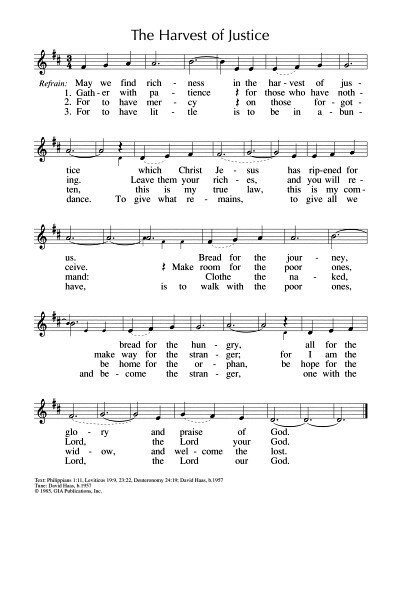 In this version the hymn has been split into to two parts to include the blessing and words of mission. NCH433 / CH727 / UMH707 / VU703 / HPP474 / GtG250 / W&R515 / Cha638 In the bulb there is a flower (Sleeth) A simple song of hope symbolised in nature. Particularly good for those churches in the Southern Hemisphere who are celebrating the start of Spring. Lyrics. UMH129 / VU636 / PH286 / PfAS109A Give to the winds thy fears (Gerhardt) I quite like some of the modern translations of this old song (from 1656, the UMH version is my favourite). The tune (HANTS) is not familiar to me, but should be learned fairly quickly with some instruction. Older style lyrics. AoV2-054 / Iona (T1AU, LFB) / MV077 / GtG414 / SFFS 2057 / G(II)438 / GC618 / RS 736 / SP&P111 / PfAS046D / URW409 / Lau909 / StF019 Be still and know that I am God (Bell / Maule) For kids, I think it may be better to focus on the positive for this reading, and this simple chant is beautiful. Works as a round or in unison. Good for kids. ATOK 311 / CH754 / GA401 Be still and know that I am God and there is none beside me (Iona) A good alternative to the above song. I like the 2nd verse especially "I am the one who calls you my friends, and there is none beside me". CH doesn't have the 2nd verse. Good for kids. PfAS091C Those who dwell in the shelter of God / El que habita al abrigo de Dios (Savage) A nice South American sounding tune, and good lyrics with a soothing chorus. W&R633 Healer of My Soul keep me at even' (Talbot) A quiet meditative song. It might be best sung as a reflection if unfamiliar to your congregation. Video and lyrics. MV062 / SP&P076 There is room for all / Chacun a sa place (Harding) A simple one-verse song; will need to be taught, but it won't take long to teach it. More communal than many other versions of this Psalm. Sound sample and sample sheet music. PfAS091D Be with me Lord when I am in trouble (Parker) A nice refrain, which would resonate well with kids, for a cantored, or spoken, reading of the Psalm. Good for kids. PfAS091D How safe it is, this hiding place (Leckebusch) A simple refrain for a cantored, or read, version of the Psalm. Very very easy. TiS 560 / AHB 465 / NCH408 / CH192 / UMH132 / VU654/655 / WoV782 / ELW757 / A&M584 / CP529 / CP(E) 368 / Cha088 / Srce2-15 / 82Hml-665 / Lau959 / StF455 / MP016 All my hope on God is founded / is firmly grounded (Neander) Most translations of this well known German hymn are not inclusive, but the NCH and WoV are, so if you have those books (BUC people, we have NCH, and I have WoV). Older version of the lyrics. Oldy-but-a-goody. TiS 594 / AHB 511 / CH517 / VU674 / LBW461 / A&M631 / PH307 / GtG846 / CP503 / CP(E) 423 / 82Hml-552 / Lau860 / StF634 / MP143 Fight the good fight with all thy might (Monsell) I left this song behind for a long time and maybe it's time to claim it back. The words are pretty old fashioned, but the idea is a good one. It's hard to hang on to faith and faithful practice. I like it best sung to DUKE STREET. Lyrics and sound samples. Oldy-but-a-goody. NCH562 / AA127 / Cha381 Take my gifts and let me love you (Murray) Good words about giving God ourselves, our goods, our money. Can be sung either to the set tune by Colin Gibson (TALAVERA TERRACE) which is a little bit tricky, or the more well known tune HOLY MANNA. A good offering song. Lyrics. NCH590 / CH621 Spirit of Jesus, if I love my neighbour. Challenging words of offering help from a position of privilege and seeking to be set free from the entrapment of possessions “If I am hugging safety or possessions, uncurl my spirit as your love prevails, to join my neighbours, work for liberation, and find my freedom at the mark of nails”. Could also be sung to the tune PERFECT LOVE if your congregation would have trouble with the newer tune. *NCH437 We shall not give up the fight (South African) A great song for congregations standing with those in a struggle for freedom. That should be all of our congregations really. Be sure to put the song in historical context so it doesn't seem too militaristic. I like the version by this choir in France! Good for kids. The rich man with Lazarus at his gate. *MV 145 / CP418 / SP&P123 Draw the circle wide (Light) A great song about welcoming all people. “Let the dreams we dream be larger than we’ve ever dreamed before; let the dream of Christ be in us, open every door”. Chorus is “Draw the circle wide, draw it wider still. Let this be our song, no-one stands alone, standing side by side, draw the circle wide”. Iona (Common Ground, HSNW) / CH362 / GtG773 / Srce213 / StF701 Heaven shall not wait (Bell / Maule) Challenging, uplifting words to a simple anglo-celtic tune. "Heaven shall not wait for the rich to share their fortunes...". Lyrics (scroll down). Traditional Dives and Lazarus (Traditional) Probably not a congregational song unless they're a bunch of folkies. Video of Maddy Prior singing it (and a great guitarist!). Lyrics. SP&P137 The world is hungry for justice / Sweet Justice (Gilio / Ressman) This song is new to me, and the words are very suitable for this reading, so it's nice to list it. It's a ballad and the verses would be best sung by the musicians at first, with the congregation joining in on the chorus until they get to know it. What ideas do you have? Please join the conversation and add them in a comment below!